Hey guy, I have been thinking of building a Shed in my back garden and after doing some research there is a lot you need to look into. To start off there is the high chance that when finished it will be a complete eye-sore and destroy the beautiful garden I have been working on. So make sure when planning to build a shed you take the design and colour in to consideration highly after the size and shape you need. At First I didn’t want to build a shed I would have been happy to keep my garden the way it is, but the longer you own a house and garden you quicker you accumulate random stuff that can be stored away and used at a later date. When starting your first storage build you will have to plan the space in the garden of where you are going to place the shed and in what direction, the last thing you want is for it to all go wrong at that point. Then there is things like what you are going to store in the shed, like if you are going to store materials especially delicate materials you need to plan what materials you will use to build the shed around this and how you will store the materials once the shed is built, you wouldn’t want you wood going mouldy or metal going rusty etc. 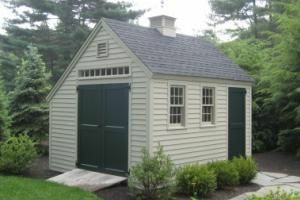 The most common garden shed designs today include the A-frame type and barn style but there are also many other styles such as pet house, playhouses, Saltbox green house, cottages, pool cabanas, or even a miniature version of your own house! When looking at garden shed designs have a look at what every manufacturer has to offer before diving into the first one you see.